Renee Tajima-Peña and Fred Ho taken by John Anthony "Tony" Butler '80. 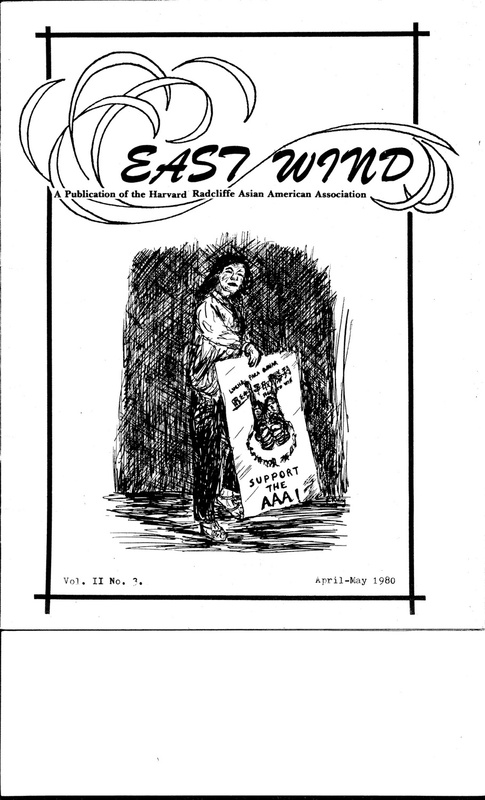 The Asian American Association was a key part of an anti-apartheid coalition. Josephine M. Lok ’80 and Bet Har Wong ’80, Chinese Americans from Boston and freshman roommates, were finding their place on Harvard’s campus. The weekend before classes began in 1976, the two decided to attend a freshman minority student orientation banquet held in the Radcliffe Quadrangle. The menu featured tacos, ribs, and fried chicken, but Lok and Wong were unable to try any. Upon their arrival, banquet staffers told the roommates that the University didn’t recognize Asian Americans as a minority. Lok and Wong left without making a scene. “When they said, ‘Your name isn’t on it,’ we said, ‘Okay, maybe we didn’t sign up,’” Lok recalls. Other students recognized the implications of the exclusion. Two tables of upperclassmen walked out of the banquet in fury. Immediately after finding out about the incident, Fred W. Ho ’79 rushed to Canaday Hall to tell his sister, Florence Houn ’80, and her roommate, Renee E. Tajima-Peña ’80. Ho was the only Asian American in attendance at most of the weekend’s minority orientation events. Jeffrey P. Howard ’69, the founder of the Efficacy Institute, which Harvard had commissioned to run the orientation, had invited Ho to observe. Howard suggested Ho write a letter to then-Dean of Students Archie C. Epps III explaining how the orientation could be valuable for Asian American students. Houn and Tajima-Peña demanded entry shortly after Houn’s brother notified them of the situation. After a brief discussion among the banquet’s staff, Howard agreed. At the time, Howard claimed that Harvard had not provided them with a list of incoming Asian American students. In a letter of resignation later that year, which was in part a reaction to the banquet exclusion, Peter A. Hardie ’77 alleged that Efficacy hadn’t asked for such a list. Yet for Houn and Tajima-Peña, the exclusion was an unforgettable moment of both pain and possibility. “I think that itself was a rallying point, to start talking to people and identifying people and getting people rallied around an issue,” Tajima-Peña says. The issue at hand was the formation of an Asian American political identity. As student anger brewed, a 1976 Crimson op-ed noted that Epps did not recognize Asian Americans as an oppressed group. Similarly, L. Fred Jewett ’57, then the Dean of Admissions and Financial Aid, told The Crimson in 1976 that the admissions office “feels the important criterion is whether natural applications are underrepresented.” Asian Americans were not, he continued, underrepresented in the applicant pool. The minority student orientation banquet of 1976 can be viewed as a microcosm of the common history binding Asian Americans together — a history of exclusion and assimilation, of invisibility and protest, of being “forever foreign” and “model minority” all at once. The exclusion of Lok and Wong galvanized Asian American students at Harvard to organize — not only for recognition, but to define their existence as a cohesive whole. It was a catalyst for a still-ongoing process in which Asian Americans sought out space for conversations on campus, fought for Asian American rights at the University, and worked in coalitions of marginalized groups to make Harvard and the world more equitable places. A photograph of Tajima's letter to her family. During high school, Houn, a second-generation Chinese American, took Asian American Studies courses at the University of Massachusetts and Black Studies courses at Amherst College. She invited Frank Chin, an Asian American playwright, to speak in her English class — her teacher “was so mind-blown, he became a full convert to literature expressions of minority people,” she wrote in an email. Tajima-Peña, a Japanese American, grew up in Los Angeles, a hub of the Asian American movement. Her first school walkout, she recalls, was in elementary school. In high school, she was heavily involved with the Little Tokyo People’s Rights Organization. Houn remembers facing racial slurs and being ridiculed for bringing dumplings to school. Her older brother, Fred Ho, was attacked by drunken sailors who called him a “g---,” at Boston Harbor during his freshman year. “I experienced things that made it easy for me to see that when Bet Har and Josephine were excluded that that wasn’t a right thing,” Houn says. Hoping to educate their peers, and galvanized by the minority banquet exclusion, students including Houn and Tajima-Peña formed Harvard’s Asian American Association in the fall of 1976, following the work of the Coalition of Asian American Students (established in 1974). The AAA still exists today. On Jan. 6, 1966, only 10 years earlier, a New York Times article describing Japanese American economic success coined the term “model minority.” In contrast to “problem” minorities, “model minorities” worked hard and assimilated into white America to overcome their oppression. In 1968, Yuji Ichioka coined the term “Asian American” — a radical political act at the time. The concept of Asian American intended to break down the model minority myth, uniting formerly divided ethnic groups and placing egalitarian demands on institutions. Picture from an Asian American Association Protest. The zeitgeist of college campuses in the 1970s was militant and revolutionary: in 1968, the Third World Liberation Front, a coalition of African, Latinx, Asian, and Native American students, protested at San Francisco State University, making the first-ever demand for an Ethnic Studies curriculum. That same year, black students at Harvard demanded improved treatment of black students and faculty, as well as a “black curriculum.” Both of these battles against university authority were, to some extent, successful. Asian Americans at Harvard in the 1970s had plenty to fight for. Recognition as minorities, an Asian American Studies department, and divestment from companies profiting from apartheid were the most visible issues, but the AAA was also trying to transform campus on a cultural level. In 1980, the Harvard Committee on Race Relations published “A Study of Race Relations at Harvard College.” In the study, 72 percent of Asian American students reported being treated differently “some,” “most,” or “all of the time” by their white peers; 43 percent said the same of faculty. Fred Ho, who died in 2014, also played a major role in the creation of the AAA. He was largely responsible for bringing together the Asian American students who would form the organization. Ho had also been organizing since high school, when he “was hit with the tidal wave of Black Power and the Black Arts movement,” as he told The Crimson in 2009. In college, Ho “was pretty unhappy except for when I was organizing and challenging the dominant ideology,” as he said in a 2009 Crimson Arts interview. At the College, he organized for labor rights for Chinatown restaurant workers and Harvard workers, and became involved in the international struggle against apartheid. In a 2005 interview, Ho described a split during the AAA’s formation between an “activist” group with political aims and a “conservative” group that wanted a more socially and culturally oriented organization. They compromised, deciding on political activities as the primary, but not only, goal of the AAA. “The AAA and Radcliffe Asian American Women’s Group were political and advocacy oriented. We had very clear objectives,” says Jane Sujen Bock ’81, a former AAA president. 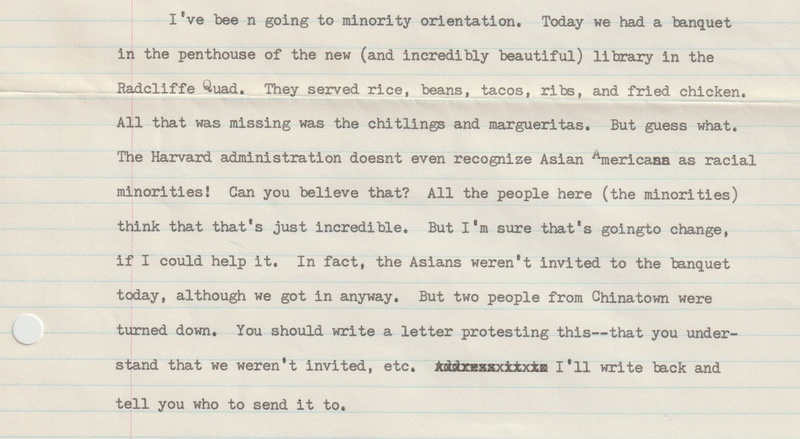 Some Asian American students were not as enthused about the political objectives of the AAA, Houn recalls. “People would rather do cultural, social things — those are euphemisms for apolitical things — and they’re very concerned about their career and they’re very concerned about their own personal status,” Houn says. And yet in many ways, this perceived dichotomy between political and cultural aims proved itself false. Asian Americans comprised 2.5 percent of the student body in 1976, meaning coming into contact with other Asian Americans, which was a necessary prerequisite to raise consciousness for political organizing, was difficult. Student activists sought to not only build community among themselves, but create welcoming spaces for all students of color on campus. “It could have been lonely, I think, to be a person of color at this university, but we made being a person of color being the party,” Tajima-Peña says. Collaborating with student leaders from similarly minded organizations, such as the BSA and Harvard-Radcliffe Raza (a Mexican-Latinx student group), they organized mixers, provided culturally specific foods, and danced to disco. “They were well-liked, very popular, and politically motivated. And that’s what I think drew everybody,” says Ricardo A. Guthrie ’80, a member of the BSA and the Kuumba singers, of the “Third World House” student leaders. Though the AAA’s activism-inclined leaders recognized the organization’s social and cultural importance on a campus with so few Asian Americans, their main task was to move beyond the apolitical euphemism of “culture.” They wanted to activate Harvard’s Asian American political consciousness. Lok, one of the women excluded from the banquet, moved to the U.S. from Hong Kong only four years before coming to Harvard. “That’s part of me probably not being as aware of the whole history of being Asian American in this country,” she says. Without the AAA’s educational efforts, Lok may have remained unfamiliar with Asian American history. The University did not, and still does not, offer an Asian American Studies concentration. Tajima-Peña, who engaged in Asian American activism prior to College, wanted to pursue her political interests academically. “So [when] I arrived at Harvard, that’s why my declared concentration was Asian American Studies,” Tajima-Peña says. “I was so naive.” Instead, she concentrated in East Asian Studies and Sociology. The AAA’s petitions and protests to have Asian American Studies or Ethnic Studies instituted at Harvard made little progress. In the late 1970s, Bureau of Study Counsel director and counselor Kiyo Morimoto and Jean Wu led a seminar on Asian American history on campus for several years. 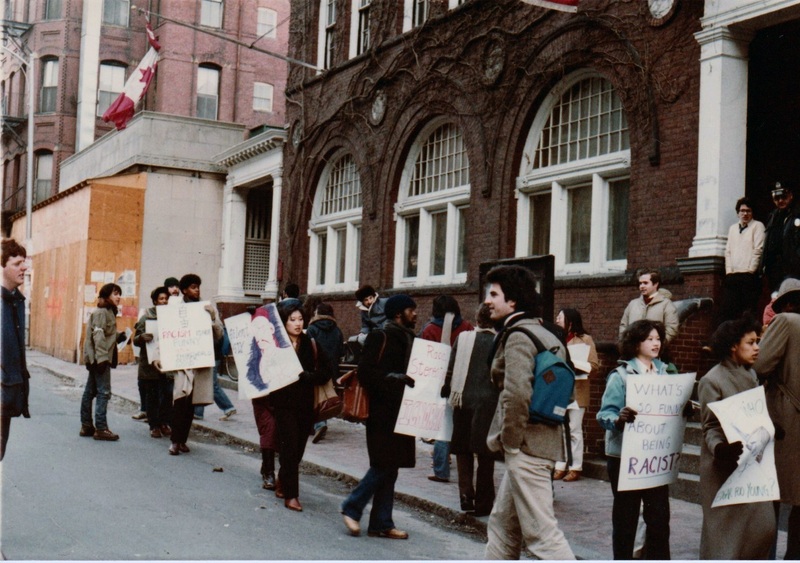 After continued mobilization by Harvard’s Asian American students, the seminar was approved for elective credit in 1981. Similar seminars, taught by faculty on top of already jam-packed workloads, were offered on an ad-hoc basis in the following years. The AAA used a variety of tactics in the 1970s to teach classmates like Lok about Asian American history. Much of their work was spontaneous and interpersonal — walking between classes, grabbing coffee, and sharing meals at dining halls. The AAA and its leaders helped fellow students navigate their identities through fleeting, individual contact. The AAA and its leaders helped fellow students navigate their identities through fleeting, individual contact. Many of these Asian American undergraduates would experience a political awakening during their time at Harvard in the late 1970s. Lok remembers that some of the most influential turning points in her personal development came during the AAA’s large, structured events. Originally called “mass meetings” (they later rebranded to avoid communist associations, Houn jests), these events ranged from the explicitly educational to celebrations of Asian American cultural production. The events not only reached Asian Americans, but also helped forge coalitions with other organizations for students of color. John Anthony “Tony” Butler ’80, a former president of the BSA, recalls learning about Asian American history at these events and discovering parallels between the Asian American and African American experience. Various organizers from the class of 1980 remember fragments of these gatherings, forming a kaleidoscope of Asian American education and cultural production: discussions of Asian American history, an educational presentation at the science center on Japanese American internment, poetry readings from Walter K. Lew, a display of the work of an Asian American stained glass artist. 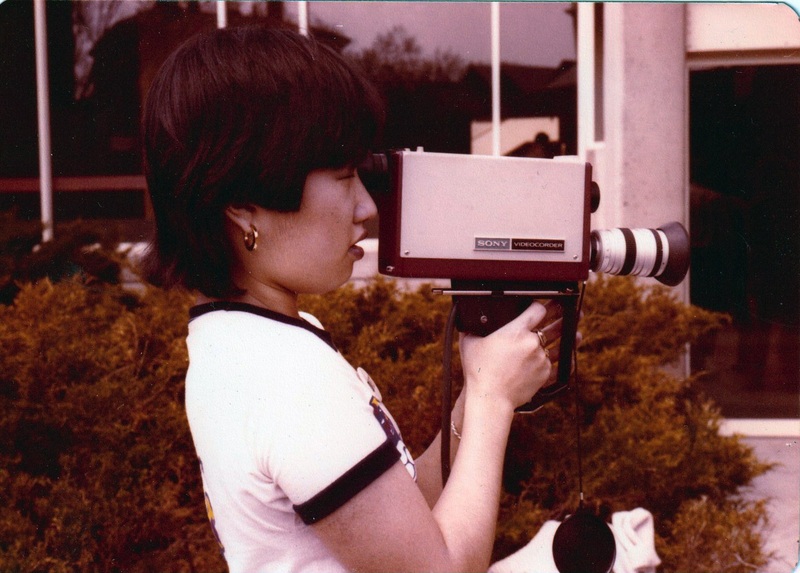 All of the activists remember the Asian Women’s Slideshow, which Tajima-Peña (now a filmmaker whose work deals with social justice and immigration), Houn, Bock, and several others produced in 1978 for the Radcliffe centennial celebration in order to teach Asian American and Asian women’s history. “I remember Renee lending me her copy stand so I [could] get photos from Life magazine and other magazines that had professional photographers taking pictures that were more moving than I could capture,” Houn says. The slideshow was soundtracked by the first album of Asian American music, “A Grain of Sand” by Chris Ijima and Nobuko Miyamoto, which evoked the Vietnam War and Asian American movement. Sepia toned or heavily tinted, the films depict Asian women in protest, silk qipao, Japanese American internment notices, and the beginnings of Chinatowns. The presentation illuminated the historical oppression of Asian women through practices such as foot binding and female infanticide. The 1976 banquet appears to be a striking snapshot of the paradoxical position of Asian Americans — they were simultaneously excluded and not oppressed enough to be a recognized minority group. 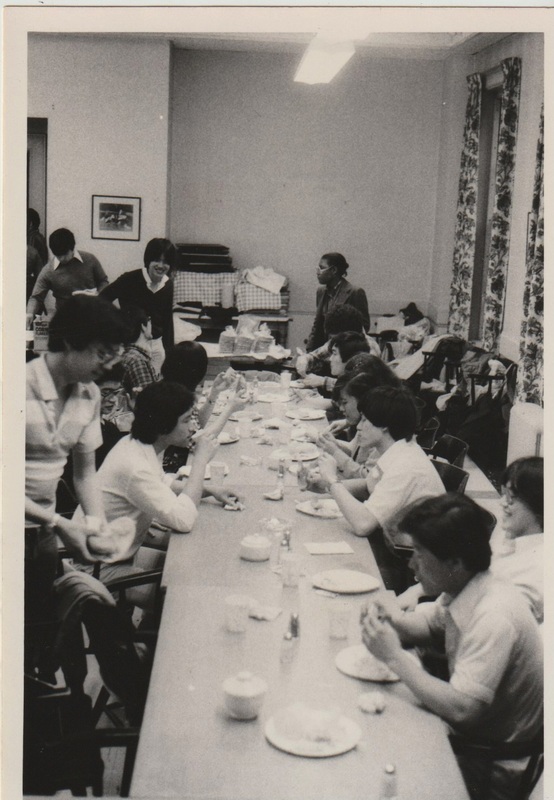 Impelled by the events of the banquet, the Asian American Association’s leaders worked tirelessly for years after their formation to improve conditions for Asian Americans, and all marginalized groups, on campus. With the support of other third world student groups, the AAA pressured the Admissions and Dean of Students offices to grant Asian American students full minority status through a series of in-person meetings and petitions, including a personal letter to Epps from Lok and Wong. One of their major goals, spearheaded by Tajima-Peña and later Bock, was working with the admissions office to establish Asian American recruitment initiatives. “We were militant,” Tajima-Peña says. They created leaflets, pushed written demands, and met with administrators to explain that Asian Americans were, contrary to Jewett’s assertion, “underrepresented” and underserved in Harvard admissions. “It was our first year, and by October I was flying out to Chicago and L.A. to do these recruiting efforts with Asian Americans in low income neighborhoods in public schools,” Tajima-Peña remembers. In the 1978 California v. Bakke decision, the Supreme Court upheld affirmative action in college admissions policies and commended Harvard for its minority recruitment. Yet establishing and sustaining these recruitment initiatives was a constant struggle, in particular for the “model minority.” An October 1978 AAA letter to Jewett argued against recent cuts to minority recruitment programs and called for Harvard to live up to the Supreme Court’s praise for the University’s affirmative action. The letter outlines the necessity of Asian American applicant recruitment: “Higher education is a democratic right of Asian Americans, although we have faced systematic exclusion from such universities as Harvard, especially with regard to Asian Americans from the inner city, rural, and Asian ghetto areas.” It points to specific ways in which Asian Americans were disadvantaged in the admissions process, such as cultural and language barriers and stereotypes of Asian Americans as quiet and exclusively STEM-focused. Picture of a Harvard Radcliffe Asian American Association publication designed by Peter Kiang '80. Student recruiters coordinated inclusive activities in an effort to increase the number and diversity of Harvard applicants. They held panels, sent out letters, and corresponded with students. At night they took over the admissions office and ran phone-a-thons. Bock recalls one particular story of recruiting in New York City at the Harvard Club of New York. “We were heading to the recruitment program, and the minority recruiters made a deliberate decision that when we went to the high schools, when we went into community meetings, when we went into the Harvard Club, we were going to dress as ourselves — meaning that we did not comply with the Harvard Club’s dress code when we showed up to the recruiting event. We were actually barred from attending, from coming in, because we looked ‘scruffy.’” It wasn’t until a Harvard administrator supervising the recruitment trip negotiated with the Club that the recruiters were allowed in. The Harvard Club of New York did not respond to requests for comment. For the most part, though, “the admissions officers were willing to listen and we had the support of Bill Fitzsimmons, who was the director then,” Bock says. After recruited students were accepted to Harvard, Asian American upperclassmen supported — and encouraged the political involvement of — the incoming freshmen. “I hadn’t visited Harvard, but when I received my admission, I was invited by AAA to come and meet them in late April or May and stay with one of them in a freshman dorm,” Seiji Yamada ’83 says, recalling how he was recruited into the AAA before he started his freshman year. Yamada would later work a paid position in the admissions office, continuing to facilitate recruitment initiatives on the west coast and in working-class Asian American communities. Orientation week provided another opportunity to engage incoming freshmen. Soon after the banquet incident, groups including the AAA and the BSA began working to reform the minority orientation program. In mid-October of 1976, Epps responded to mounting student pressure by agreeing to allow Asian Americans to participate in minority-oriented events sponsored by the Dean of Students Office. But he still refused to recognize Asian Americans as minorities or an oppressed group. “There was this two-sidedness of you’re a minority, but you’re not really a minority,” Houn recalls. The AAA and other student groups of color persisted. By 1977, they were reshaping the “minority” orientation program into a “third world” orientation, a name which recognized the commonalities between marginalized groups and which emphasized how third world people are, globally, a majority. Houn and Wong, along with representatives from other student groups, attended organizing meetings called by the Dean of Students office and were soon leading the orientation’s planning efforts; in 1980, Houn and Wong co-chaired the program themselves. The orientation acted as an incubator, bringing new students into political groups like the AAA and the BSA through organization-specific events and then using larger events to promote broader coalition building. “It was like this three year environment where the Asians were first excluded from minority orientation and [told] ‘No they’re not part of this movement of people of color in the United States,’ to these two [Asian American] ladies are chairing the minority orientation,” Houn says. The AAA’s mission was coalitional from its inception — it envisioned Asian Americans as part of a global network of third world people. “Asian Americans, I don’t think we could have done it on our own,” Tajima-Peña says. Third world student groups worked together to launch massive protests calling for divestment from the South African Apartheid regime, a Third World student center, and Ethnic Studies. Ho embodied this coalitional nature: He worked heavily with black and Asian American activists throughout his life and would go on to pioneer Afro-Asian jazz —though he rejected the term “jazz” as colonial and derogatory — performing with Dizzy Gillespie and Archie Shepp. “You could see him questing to try to span different backgrounds and experiences he had and respected black culture and Chinese culture and became a very valuable mentor and leader for those of us who were enrolled at that time,” Guthrie recalls. Ho also brought his energy to Malcolm X Weekend, an event organized by the BSA in 1978 and 1979 not only to commemorate Malcolm X, but also to build third world solidarity and imagine paths to a more equitable future. In 1978, the weekend featured speakers including Yuri Kochiyama and David Sibeko of the Pan African Congress. Kochiyama worked with Malcolm X and built links between Asian American and black organizers. She is regarded by many as a legend and founder of modern Asian American activism. Ho and Houn frequently visited Kochiyama in her Harlem apartment, and they were instrumental in bringing her to campus. “It was meaningful that we got people like Yuri Kochiyama, and learned that there was a Yuri Kochiyama, and how Malcolm X had allies from other groups,” says Butler, a former BSA leader and one of the weekend’s principle organizers. 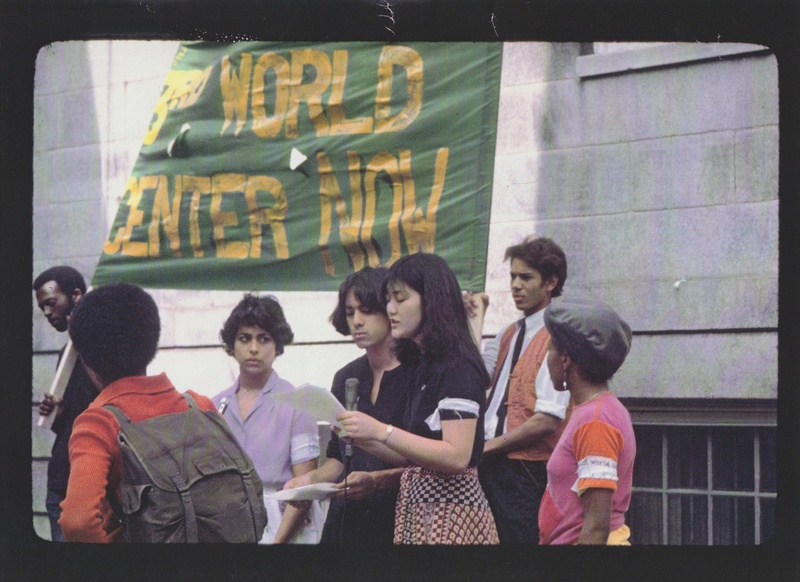 Picture from a Third World Center protest featuring Florence Houn ’80. Still, at the end of four years, Houn and Tajima-Peña knew there was more to be done in the fight for Asian American students on campus. Neither Houn, Tajima-Peña, or Lok can remember a single moment when the University officially defined Asian Americans as minorities; nor is there a single inflection point after which an Asian American political identity was cemented on campus. Instead, their work built gradually. Countless events and conversations, growing piles of petitions, and protests leaving layers of footprints on Harvard’s soil formed the beginnings of Harvard’s accreting Asian America. A previous version of this article incorrectly stated Tony Butler was a former BSA president. In fact, though Butler was a leader in the organization, he never served as president. A previous version of this article incorrectly stated Kiyo Morimoto and Jean Wu were graduate students. In fact, they were the director and counselor of the Bureau of Study Counsel, respectively. A previous version of this article incorrectly stated that Coalition of Asian American Students was established at Harvard Law School. In fact, it was a college-based organization. A previous version of this article misspelled Renee Tajima-Peña's surname. —Staff writer Matteo N. Wong can be reached at matteo.wong@thecrimson.com. Follow him on Twitter @matteo_wong. —Staff writer Letitia C. Chan can be reached at letitia.chan@thecrimson.com.